Aishwarya Rai Bachchan is ready for the Cannes Film Festival and was snapped at the Mumbai airport on May 10, 2018. Once again the actress was accompanies by her daughter Aaradhya Bachchan and the mother and daughter duo looked adorable together. Aishwarya and daughter Aaradhya twinned in black outfits as they made their way in to the airport. The actress headed to France to attend the Cannes Film Festival. The Sarabjit actress will be walking the red carpet of the Cannes Film Festival for the 17th time this year. Aishwarya has over the years improved the glam quotient at the festival. 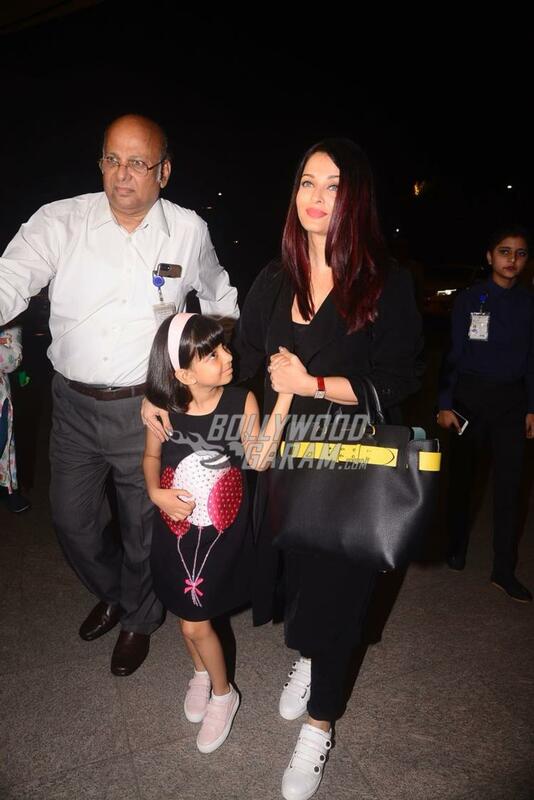 The Jazbaa actress and daughter Aaradhya were all smiles and poses for the media at the airport. Aishwarya looked pretty in a black attire and minimal make-up. Aaradhya looked adorable in a black outfit with printed balloons and pink sneakers. The actress officially joined Instagram before her appearance at the Cannes Film Festival. Aishwarya will be walking the ramp on May 12, 2018 and May 13, 2018.